White_A2_Envelopes_-_4_38_x_5_34 is rated 4.8 out of 5 by 12. Rated 5 out of 5 by Brookester from Super friendly and prompt service! I received great communication about my order and it was delivered very quickly! Rated 5 out of 5 by Snail from Great value, fast shipping! I was SO impressed with how quickly JAM got these to my doorstep after ordering them. Good value, nice, normal envelopes. Rated 4 out of 5 by Janeen from Very nice note card envelopes I purchased 1500 of these for note card sets that I make. I like the look, feel and overall quality for the price. They work perfectly with my note cards sets. How much are they? For 500 or 1000? Hello, 500 envelopes would cost $300.00. 1000 envelopes would cost $540.00. Thanks! What is the paper weight of these envelopes? Hi there! It would depend on which envelope you decide on. If you click your choice and scroll down to the table, it will say the paper weight. Thank you for your question! I am looking for 32 lb. Bond white 4 3/8 x 5 3/4 envelopes. I don't see the paper weight in anywhere in the ones listed. if I would order 10,000 how much would they be? Hi Barbie. Sorry for the delayed response, we are having issues with our Q&amp;A system. If you are still interested in these envelopes, please ask your question again using the questions/comments form at the bottom of the &quot;Contact Us&quot; page: http://www.jampaper.com/contactus.asp. Sorry for the inconvenience! Does this envelope come with a straight back cut like shown in the pictures? If so, how come the options show a V back? This specific envelope has a straight back: https://www.jampaper.com/ecom/index.asp/show/detail/cat/115/prd/402/c/1373/s/951 Hope this helps! What is the weight of these A2 envelopes? The weight of these envelopes are 24 lb. Hello, Unfortunately we do not customize these envelopes. Thanks! We would make sure the item number is 66670 - which is our White Linen Envelopes. Appreciate the classics! With White A2 Envelopes you can experience all the greatest hits the white envelope selection has to offer. From red foil linings to dark onyx exteriors, these white envelopes offer more than the name implies. Send anything from invitations, to small letters, to small holiday cards in these convenient envelopes! This selection includes something for every purpose. Fill these wonderfully white mailing receptacles with letters, greeting cards, invitations, photographs and more. 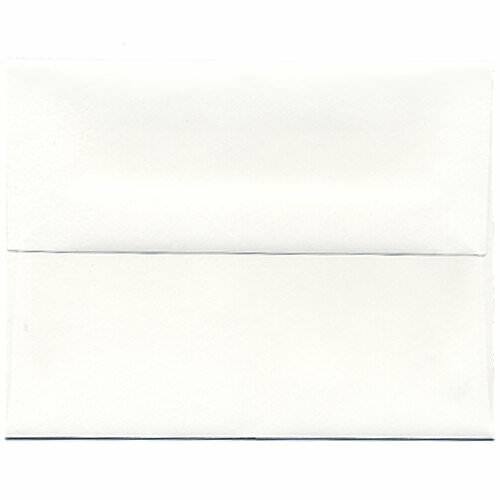 These booklet style envelopes are sold in straight flap and vflap styles. With many colors and varieties to choose from, you can pick the A2 envelope that fits your occasion and purposes the best! White A2 Envelopes measure in at 4 3/8 x 5 3/4 and are available in 22 different variations of colors and closures. Among these 22 variations are envelopes made of vellum paper, recycled paper, wove textured paper, and more! Order in increments of 25 or bulk a2 envelopes upwards of 1000.